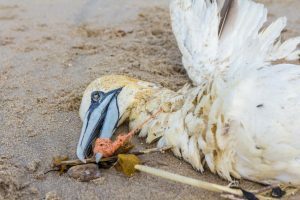 If you have been watching nature programs in the media over the last few weeks, you’ll see a lot of focus on plastic pollution in the oceans and water bodies. 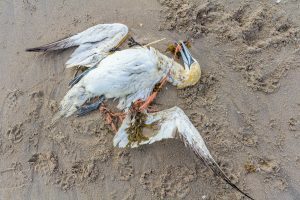 I watched turtles tangled in nets, albatross feeding their chicks chunks of plastic pieces and countless sea birds drowned, poisoned and choked by the stuff. Most of these species were pretty exotic and in far flung places from my base here in the Netherlands. I thought it was all very far away and because of that, wasn’t expecting to see anything like that here. How wrong I was. 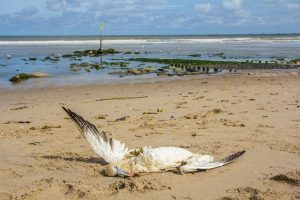 In the weekend, while taking a constitutional walk on the beach I came across a large white seabird lying dead on the beach. As I got closer, I saw it was a northern gannet. The gannet is a really large diving and fishing bird that hunts the open sea for school fish in the North Sea and Atlantic. When I got really close, I saw to my disbelief that the bird had fishing net wrapped around its wings and beak. 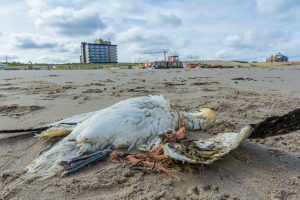 In the previous days, a storm had been blowing and must have swept the bird from it’s feeding grounds. 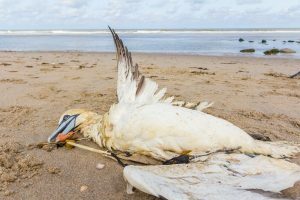 At first I thought it had to be some kind of media event cooked up by a wildlife group to bring attention to the plight of sea birds dying from plastic pollution. I hung around and waited for the environmentalists to descend, explaining about plastic pollution and asking whether I was doing my bit. When no one showed up, it started to dawn on me that this was an actual thing. 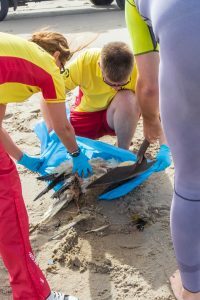 This huge bird had become tangled and died a horrible death and washed ashore on my beach. I then got busy with the camera and documented this creature’s plight. After a while, some people walking on the beach paused to take a look. But many just took a disinterested sideways glance and continued on their walk, non the wiser. After a while, some lifeguards took an interest in me taking photos of the bird and came to have a look. I said “maybe you should leave it here for a while and let people see it”. They went away and after 30 minutes came back with shovels. It seemed beach hygiene had a higher priority. 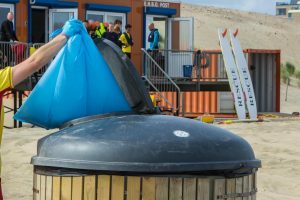 The gannet and its fishing net was shoveled up, put in a bag and then unceremoniously put in a bin. Only a few people were aware of the huge bird that is seldom seen this far south and its futile struggle to stay alive. The beach strollers continued their strolling past more plastic pollution scattered on the sand. The lifeguards kept doing their job and I kept walking, albeit with a sense of waking up from this insulated cocoon I had been in. The plastic death had found it’s way into my world.